After that there were more hit albums, with “Screaming For Vengeance” (1982) being particularly popular in America. Their stadium tours were automatic sellouts and Judas Priest were not shy at giving bands on the way up a helping hand either, including Iron Maiden. But after great success in the Eighties, the Priest decided on a slight change of direction. Out went technically brilliant drummer Dave Holland and in came the hard-hitting goliath of a percussionist, Scott Travis. Also discarded were the synthesizers which Priest had been using to fill out their sound, both in the studio and in live concerts. The results were stupendous and “Painkiller” is internationally recognized as one of the top heavy metal albums of all time. In most charts it’s up there in the top 3. 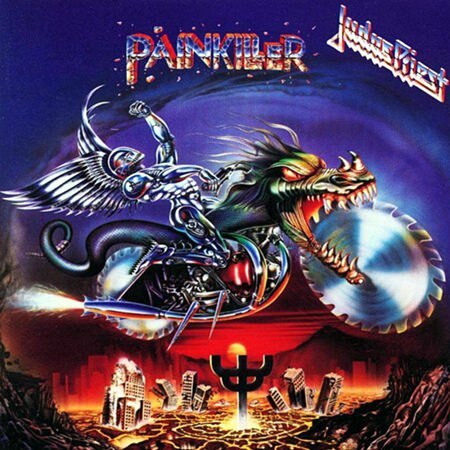 The opening title song “Painkiller” sums up the whole album. Beginning with the power of Travis’ drums, the temperature suddenly rises with a rattling K.K. Downing guitar break as the whole band come rolling in with one of the heaviest sounds every heard. Rob Halford’s vocals are a step up from what anybody else has ever tried, nobody else has that range, and the dual guitar rampage by Glenn Tipton and Downing takes the whole twin-guitar thing to a new level. Ian Hill must be close to mashing the strings of his bass guitar as he rips through them, thundering the opening song along while Scott Travis makes the Judas Priest drum-stool his own and cements his place as one of the ‘heaviest’ drummers the world has ever known. There are several memorable moments during the 6 minutes and 7 seconds of “Painkiller”. Rob Halford’s screams at 1 minute and 27 seconds, again at 4 minutes, and 19 seconds, and the final scream of triumph at 5 minutes 28 seconds are all earth shattering, whilst the dual guitar break, which takes the whole song into another gear at 2 minutes and 15 seconds, is unlikely to ever be repeated for pure excitement. If after listening to this track you are not a 100% heavy metal fan, smashing your head into walls, shaking your hair uncontrollably, and have not already broken three strings on your air guitar, then you are never going to be a heavy metal monster and please go back to one-hit wonders and listen to what Simon Cowell suggests. 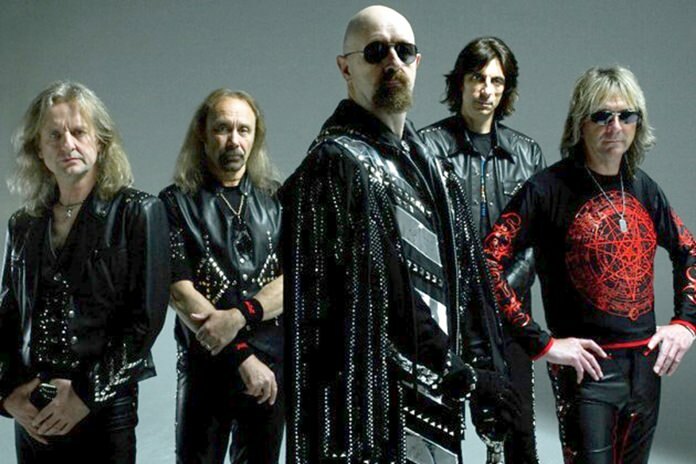 British heavy rockers Judas Priest. For those who choose to follow the righteous path however, rest assured you are not alone. So far the band has sold close to 50 million albums worldwide and over 100,000 people turned up to see them rock the joint at the Rock in Rio music festival in 1991. Just by reading the song titles you will be able to get a pretty good idea of what the rest of the album offers, “All Guns Blazing” being a prime example (and yes, they most certainly do). Only on “Night Crawler” do the synthesizers make a return, giving a house of horror opening before the band coming raging back in. “Battle of Hymn” is just a short snippet of under a minute and used for over a decade as introduction music for the band’s live sets. Apart from that, expect no respite. Note: Written by Hells Bells and Mott The Dog, who can often be found banging their heads together at Jameson’s Pub, Nova Park, Soi AR, North Pattaya.